On October 29, Hurricane Sandy made landfall in Atlantic City, New Jersey, after causing storm surges and wreaking havoc up the East coast. From West Virginia to New York, the hurricane wrought destruction on a massive scale. Thousands of people were evacuated and many lost their homes – some even lost their lives. Damage estimates are in the billions of dollars, and the death toll has increased from initial reports below. Banks responded to the hurricane by waiving fees for customers in a dozen states. Fees for foreign ATMs, late credit card and loan payments, returned checks and over-the-limit charges were automatically waived by many banks from October 30 to November 7. Chase waived fees nearly a week longer and other banks were doing it on request. Many banks also offered higher lines of credit to customers in the storm-affected states below. Many of those banks also made substantial donations to the American Red Cross and other charities aiding storm victims. But even those hefty donations barely put a nick in their profits. 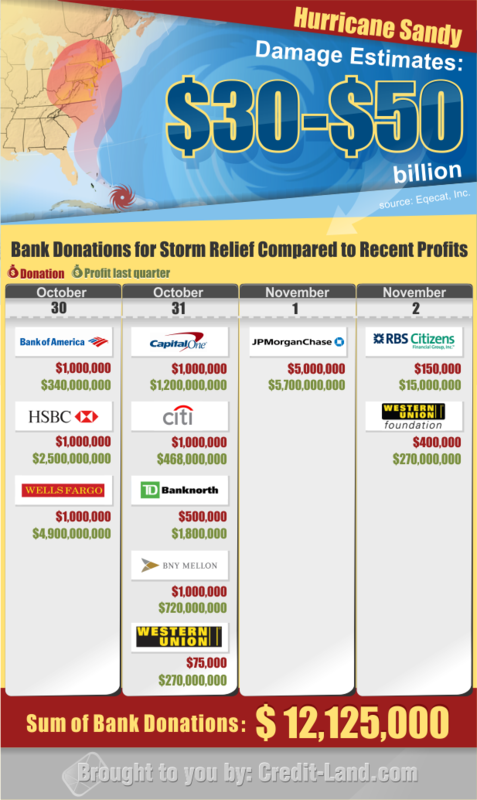 We compare bank donations to their profits last quarter in this chart. Will they dig deeper into their pockets in the aftermath of the storm? Please see below for full details on the storm damages, bank fees waived, and bank donations.